The Divisional Playoffs were tough for the Newark Eagles, going out to 5 full games and no time for rest between series. On the other hand the playoffs went only 3 games for the Seals of San Francisco, and they have had plenty of time to rest before taking on the Eagles . . . maybe too much time . . . but not enough time to get Mickey Mantle (.317, 30, 69) or Kevin Brown (11-5, 3.25) off the Disabled List. 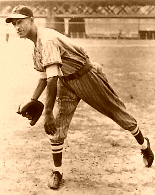 Smokey Joe Williams (15-9, 4.18) opened the game on the hill for the Seals, opposed by Sam Crawford (9-8, 2.98). The first pitch from Crawford to Pete Hill (.296, 13, 60) was a called strike. Pete didn't have to swing at the next four pitches in order to get to first base as Williams obliged with a free pass. The seventh pitch of the inning finally brought a swing from a batter as Home Run Johnson (.335, 10, 68) fouled the pitch off. On the next pitch, another ball, Pete Hill took off for second base and made it ahead of Joe Torre's peg. But at this point Williams bore down and dispatched Johnson, Mays and Leonard to end the threat. Crawford didn't have Williams' trouble: 3 pitches and he had two outs already. Six more and he had Boog Powell (.261, 7, 28) on a strike out for the third out. Smokey Joe for his part in the second tried to get the ball over -- the only problem was he didn't have much on it. Four pitches into the second and the Eagles had men on first and second with no out. Fourteen pitches later saw a strikeout and a walk to fill the bases, and Sam Crawford (.204, 0, 7) himself coming up to the plate. On a 1-1 pitch Crawford hit a grounder that found the seam between Lou Whitaker and Boog Powell and two runs scored. By the end of the half-inning the score was 4-0, Newark. The Seals could not respond, and 8 consecutive outs later Boog Powell finally broke the streak with a double deep the right field line. But Joe DiMaggio (.271, 47, 138) was walked on 4 pitches, and Torre (.271, 9, 40) grounded out to end the inning. Unlike the Seals, who appeared tight and uncomfortable, the Eagles were loose. Pete Hill ran out an infield single in the top of the 5th, and was sacrificed to second -- where he promptly tested and bested Torre's arm again, this time stealing third. He later scored on a groundout. 5-0, Newark. By this time Max Manning (3-3, 3.67) was pitching for the Seals, and he did well until the 7th when he walked Crawford to lead off the inning. It is bad enough to walk the leadoff batter, but when that batter is the pitcher . . . Things fell apart at this point, and after a single and fielder's choice Joe DiMaggio dropped a fly ball to allow Crawford to score, and then Torre let a pitched ball get past him for another run. 7-0 Seals. In the bottom of the 8th the Seals finally got on the board, and it was Boog again with a long triple to knock in Lou Whitaker (.218, 4, 29). Powell came in to score 2 pitches later on a groundout. 7-2, Newark. Not ones to sit back, the Eagles put 2 more on the board in the 9th against Gene Garber (5-2, 4.02) with a Buck Leonard (.288, 30, 119) home run. The Seals couldn't muster an answer and so the game was written in the books, 9-2 Newark. This day belonged to the Eagles. With 96 regular season victories plus 3 victories in the the Divisional Playoffs, the Eagles were playing for keeps on this, their 100th victory. Temperature: 63, Sky: clear, Wind: left to right at 8 MPH. 60 degrees, clear sky and wind averaging 8 MPH straight out to center field. A beautiful day for a ballgame, and the fans got treated to a good one courtesy of the Seals' Christy Mathewson (12-5, 3.27). Newark countered with Juzo Sanada (15-7, 3.16), who had only one bad inning in this game, but Mathewson had none. Mathewson's game didn't start out especially well. In each of the first four innings he allowed a man to reach base. Once there they did move around the bases and threaten to score, but none actually did. Starting in the fifth inning Mathewson put the side down in order. He continued to send them back to the dugout 3 at a time, baffled and bamboozled, until the game was over. Sanada did almost as well except for the 4th inning, when Joe D opened things up with a leadoff, first-pitch single to left. Joe Torre moved him up with a single up the middle, and then Moises Alou (.253, 3, 5), subbing much of September and all of the Playoffs so far for Mickey Mantle, singled to load the bases. All of this took but 5 pitches. Sanada was right on the plate but evidently the batters had his number. 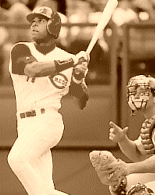 Barry Larkin (.294, 7, 31) was up next, bases loaded, no out. Sanada tried to get fancy for 2 pitches, both called balls. Everybody in the park knew the next pitch had to be somewhere over the plate . . . and it was . . . for a brief second until it made contact with Larkin's bat and was propelled into the cloudless sky, red-stitched white orb against a brilliant blue. A thing of beauty. A thing of 4-run beauty. Grand Salami! Bring'em all home! Baddabing baddaboom. Wham! Sanada, one must say, did not lose his composure. He set down the next 11 batters, but the damage was done and no amount of wishing could change the scoreboard. Even though he was second in the Union League in Average Run Support at 6.7 runs per game, he would get no support this day. San Francixco 4, Newark 0. That was all she wrote, Matty wrapped things up neatly -- a 3-hit shutout to even the Union League Championship Series at one game apiece. Temperature: 60, Sky: clear, Wind: out to center at 8 MPH. The Series came into New Jersey for the third game and the hometown fans were raucous. Iron Man McGinnity (11-6, 4.39) was all set to set the Seals batters down like so many bowling pins. The Larkin Grand Slam was seen as a fluke. After the first half-inning the hometown fans were in shock. First pitch of the game from McGinnity was slapped to right-center by Babe Herman (.261, 5, 20) for a single. Lou Whitaker (.218, 4, 29) followed with a seeing eye grounder for another single. 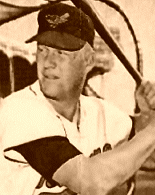 Boog Powell (.261, 7, 28) lined a soft one to shallow center but Herman was cut down at the plate by Willie Mays. Joe DiMaggio (.271, 47, 138) laced a liner into right-center for another single and another run. Joe Torre (.271, 9, 40) first-pitch hitting lofted a sacrifice fly to center. Then Moises Alou (.253, 3, 5) pulled a grounder down the third base line for a double for another run batted in. Up to the plate came Barry Larkin (.294, 7, 31), and out of the park went McGinnity's 2-0 pitch. Madlock (.286, 6, 25) followed with yet another single, but pitcher Billy Pierce (.105, 0, 3), the ninth batter of the visitor's first inning, mercifully grounded out to first to end it. San Francisco 5, Newark coming to bat. The Eagles did indeed get the bases loaded on two singles and a walk, but Joe Cronin (.290, 9, 59) was caught looking on a 3-2 pitch to put the zero on the board. The top of the next inning saw Lou Whitaker take a McGinnity offering out of the park, and that also sent Iron Man off the field and to the showers. Terris McDuffie (4-2, 3.89) came in and was able to hold the Eagles for the rest of the inning and the next, but when Whitaker came up again he put another brand new spheroid into the really cheap seats -- over in the junkyard past the right field wall. 7-0, San Francisco. The Seals weren't finished, and in the ffth inning of a game that already seemed too long for the hometown cranks, the visiting team put 3 more on the board with a single, sacrifice, walk, single, and double. 10-0, Seals. Where were the Eagles? Billy Pierce (7-5, 4.58) used a lot of pitches to kept the Eagles grounded until the bottom of the sixth when Buck Leonard (.288, 30, 119) lined a double down the line to start things off. Two batters later Larry Doby (.279, 29, 87) knocked him in, and then Quincey Trouppe (.271, 14, 55) put the powder to the ball and tallied 3 more. 10-4, Seals. Next inning two infield singles and a lined single scored the Eagles fifth and last run, and also knocked Pierce out of the box. The rest of the game was almost like a completely different game. After 26 hits were rapped out in the first 6 innings, only 2 more, both of the infield variety, were hit in the last third of the game. San Francisco up 2-1 in the series. Temperature: 60, Sky: partly cloudy, Wind: right to left at 7 MPH. Newark came in looking to even the score, and sent hard-nosed, junkball lefty, Sir Skinny, Luis Tiant Sr (6-9, 4.55) out to do the job. San Francisco countered with their high-kickin', zany portsider, Lefty Gomez. (4-9, 6.27). The ATL's inuagural season was not a good one to lefty picthers. Randy Johnson Disease struck nearly all of them. These two were no exception. So the game that followed was not what was expected. Gomez had his slow curve working the corners, and Tiant Sr had his screwball mixing well in several speeds. The Seals came out of the dugout with a purpose in the first inning. They took advantage of early wildness on Sir Skinny's part to work two walks for the first three batters. An error by Cronin (.964, 23 E) loaded the bases, and then an infield single by Moises Alou (.253, 3, 5), and a groundout by Sherry Magee (.311, 4, 14) scored 2 to move the Seals out in front at the outset. Lefty Gomez was a little more in control, oddly enough, and although he walked a batter in the first, the Seals opening runs went unanswered until the ninth inning. All game long Gomez & Tiant Sr. worked the plate edges of the plate with a myriad of pitches. Although they both had small spots of trouble after the first, they both put zeros up from the second to the eighth. They both threw a lot of pitches, but nary a batter was comfortable at the plate all night long. Gomez struck out 9 for the game, and allowed 6 hits. Tiant Sr. allowed but 5 hits, and struck out 3. His 4 walks hurt though, as two came in to score. Both teams scored a run in the ninth, but this game was about the pitching -- and the pitching had decided the game in the first inning. Lefty Gomez, maligned throughout the year because of a penchant for letting runners score, finished what he started. He gave the bullpen a rest, and put the Seals up 3-1 for the series, stopping the powerhouse Eagles in their own home park. One more game in Newark, and the Eagles are in a position they haven't seen all year: facing elimination. Temperature: 56, Sky: partly cloudy, Wind: out to center at 8 MPH. Ruppert Stadium was surprisingly quiet before the game. Neither team was giving interviews, and both had locked out all reporters. Not a peep from the front offices. Not a word from anyone. Nada. 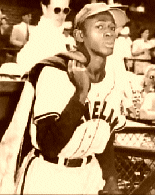 Satchel Paige (9-9, 5.12) was just as animated as ever as he got ready to pitch with his team up against the Wall of Elimination, but it was a long-distance situation as far as the reporters were concerned. On the other side Smokey Joe Williams (15-9, 4.18), loser of Game 1, was restrained and serious -- again long-distance. 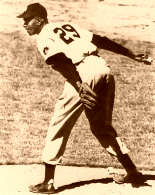 The game started and Satch bedazzled the Seals in the top half of the first, putting Herman (.261, 5, 20) and Powell .261, 7, 28) away on strikes, and getting Whitaker (.218, 4, 29) to ground weakly back to the mound. Paige had a tough season, but this was the playoffs, and no way was his team going to be eliminated with him on the mound. Paige was to trot out his complete arsenal as the game wore on. He used his wide, breaking curve to great effect, mixing it with his "bee-ball," his "jump-ball, his "long-ball," his "trouble-ball" -- and even his famous "hesitation-pitch." This game Satchel Paige was determined to come out the other side a winner. His team mates jumped on Williams in the first to give Paige a lead to work with. Buck Leonard (.288, 30, 119) lined a double down the line to score Willie Mays (.312, 39, 134) and put the Eagles up 1-0. First time in a while the Eagles had been up on top. Second inning Satchel Paige struck out the side: Joe DiMaggio, Joe Torre and Moises Alou. He struck out DiMaggio on 3 pitches -- the first and third were called strikes. Joltin' Joe just shook his head and walked away. Satchel had come to pitch. San Fran's Bill Madlock (.286, 6, 25) reached first in the third on a seeing-eye grounder between Buck Leonard and Home Run Johnson. But he was erased one pitch later when Smokey Joe Williams (.279, 1, 8) grounded into a 4-6-3 doubleplay. As if in response to that hit, the bottom of third was lit up a bit by the Eagles. One pitch and Roy White (.283, 6, 31) opened it up by reaching on an error by Barry Larkin (964, 12 E). A second pitch and a fielder's choice put Home Run Johnson (.335, 10, 68) on first, where after a third pitch popped up and out by Willie Mays, he promptly stole second.on the fourth pitch of the inning. After a called strike, Buck Leonard lined the sixth pitch of the inning for another double, this one to left-center scoring Johnson. That must have flustered Williams as the next four pitches never came close to the plate as Larry Doby (.279, 29, 87) walked. Robin Ventura (.203, 5, 15) then worked him out for six pitches before knocking a single between first and second to bring Leonard in to score. Ventura stole second on the next pitch, but Quincy Trouppe (.271, 14, 55) flied out to end the inning. 3-0, Newark. The Seals continued to wave ineffectually at Satchel's pitches, and even when they didn't swing they looked like they were fooled. Paige was enjoying it, playing it up for the crowd in his best fashion. That made 12 in a row set down to start the game, with the help of the doubleplay ball. The fifth the Seals came knocking. Joe Cronin (.964, 23 E) flubbed Joe DiMaggio's grounder, but then Paige struck out Joe Torre on three called strikes. After another called strike to Moises Alou, Satch tried to put some extra mustard on a pitch -- and it sailed past Trouppe all the way to the backstop. Wild Pitch, DiMaggio advances. Moises Alou then stroked a single to shallow right field, and Joe DiMaggio decided to challenge Larry Doby's arm. Bad mistake. A strike from right field cut Joe down at the plate, and ended the rally. The bottom half the Eagles responded with a lead-off home run by Willie Mays. Buck Leonard followed by knocking Williams out of the box with a single to right-center. In came Max Manning who got the next three batters without trouble. 4-0, Newark. The next offensive action came from Satchel (.164, 2, 8) himself, as he doubled to left-center in the sixth. He made it to third, but never scored. But perhaps the time on the bases tired him a bit, as Lou Whitaker caught one of his pitches next inning to leadoff with a double down the line. Trouppe had trouble with another Paige specialty pitch, and was charged with a passed ball as Whitaker advanced to third. From there a soft groundout by Powell to Johnson scored Whitaker. 4-1, Newark. The Seals scratched out 2 more hits in the eighth, and another in the ninth, but could not put up any more runs. And so on this day, Satchel Paige saved his team from elimination in his own special style. The Seals still lead the series, 3-2, but Newark gets to breathe deeply for one more game at least. The news blackout was lifted briefly when the Seals were leaving after the game. 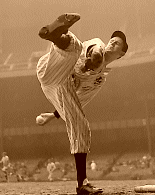 Joe DiMaggio spoke for the team when he said, "Satchel Paige is the best and fastest pitcher I ever saw," When told what DiMaggio said, Paige responded half-jokingly, "They all say I'm the best pitcher they ever saw . . . I can't understand why they can't give me no justice." Temperature: 62, Sky: clear, Wind: right to left at 5 MPH. The Pittsburgh Pirates of the Legends League came back from a 3-1 League Championship deficit to force a Game 7, and the powerhouse Newark Eagles find themselves trying to equal the Pirates in this regard. All year long the Eagles soared far ahead of all the competition. But first the Division Playoffs went down to the wire, and now the Eagles have faced down elimination in Game 5, and hope to do so in Game 6 as well. Then, if there is a Game 7 everything will be equal once more. Sam Crawford (9-8, 2.98) took the mound for the Eagles, the Game 1 winner. 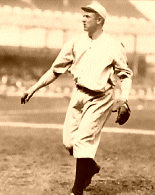 Christy Mathewson (12-5, 3.27) opposed him, the Game 2 winner. The game started out in fine fashion for Newark: Pete Hill (.296, 13, 60) reached on an infield single, Home Run Johnson (.335, 10, 68) lined the next pitch (3rd of the game) into left-center for another single, and then The Say Hey Kid (.312, 39, 134) took the fourth pitch of the game and sent it for a ride that ended deep in the left field bleachers. Four pitches and the Eagles were up by three already. But they weren't done yet: Buck Leonard (.288, 30, 119) lined a double down the first base line, and a couple batters later Quincy Trouppe (.271, 14, 55) brought him in with a double of his own. But Quincey got greedy and tried for three, and was cut down by Babe Herman (35 G, 4 Assists) to end the inning. 4-0, Newark. It almost seemed that the Seals were cowed. Moises Alou (.253, 3, 5) worked a walk in the second inning, Bill Madlock (.286, 6, 25) did the same in the third, and Boog Powell (.261, 7, 28) earned a walk for himself in the fourth. That was all the Seals were able to muster in the first four innings -- four inconsequential walks. But by the same token, the Eagles seemed to be winding down themselvesall the way through the fifth. In the bottom of the fifth the Seals started to come alive. Or it should more correctly be said that those four inconsequential walks that preceeded this inning were a harbringer of doom for Sam Crawford. After Alou and Barry Larkin (.294, 7, 31) strolled up to the plate and then back to the dugout after recording the first two outs of the inning, Sam Crawford lost it. He walked Bill Madlock on 5 pitches. Sherry Magee (.311, 4, 14) pinch-hit for Gene Garber (.000, 0, 0), who had replaced Mathewson in the top of the third. Magee brought the count to 3-2 before he walked. 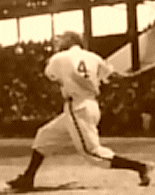 Babe Herman (.261, 5, 20) then mimicked Madlock by walking on 5 pitches to load the bases. 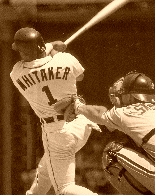 Lou Whitaker (.218, 4, 29) took the count to 3-1 before he lined a single to shallow center plating Madlock & Magee. Boog Powell the worked the count to 3-2 before lining out to Leonard and ending the inning. 4-2, Newark. The top of the next inning Chipper Jones (.257, 17, 73) went deep off Mike Jackson (4-5-2, 3.58) to take back one of those runs. 5-2, Newark. in response, the Seals mustered singles by Joe DiMaggio (.271, 47, 138) and Moises Alou . . . but two fielder's choices and a popup ended that in a hurry. The seventh inning was more than the Stretch in this game. The seventh inning marked the turning point. Mike Jackson set down the Eagles in order, but Sam Crawford could not do the same. Hughie Jennings (.385, 1, 7) pinch-hit for Jackson, and was hit by a pitched ball. While he danced off first base drawing two throws over, Babe Herman struck out on six pitches. Lou Whitaker worked the count to 3-1 . . . Crawford seemed to be pitching from the hole all game long . . . before slicing a single to left. 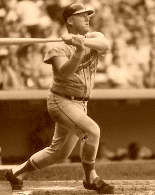 Boog Powell then toughed out a 3-2 count to bash a long triple to the deepest part of left-center. That was all for Crawford, and Steve Reed (11-4-2, 3.18) came on to face Joe DiMaggio. DiMaggio hit a wobbler to leftfielder Pete Hill (.994, 1 E), who couldn't hold on to it and let Joe reach second on the error. That tied the score at 5-5, and that was it for the inning as Reed closed down Joe Torre (.271, 9, 40) on strikes and Alou on a pop fly. But it was a new ballgame in more ways than one. The top of the eighth saw Johnny Allen (1-1, 3.14) and Harry Danning (.254, 2, 13) come in as the new battery combination. Allen struck out Home Run Johnson for the first out, and Larry Doby (.279, 29, 87) for the third out. In between Willie Mays flied out and Buck Leonard boomed a triple straight down the right field line. But he was stranded thereon third when the inning was over. Steve Reed pitched to six batters in the bottom of the inning, and many will undoubtedly say that it was six batters too long. 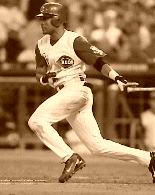 Barry Larkin (.294, 7, 31) singled. Bill Madlock singled. Harry Danning hit one back to the mound and Reed tried to go home with it. "Tried" is the operative word, and all runners were safe. Babe Herman flied out for Out #1. But Lou Whitaker walked to load the bases, and on the very first pitch to Boog Powell . . . they were all cleared again as Powell walloped a grand slam deep to right-center. No mistaking that one, it was long gone. The ball and the game. 10-5, San Francisco. Terris McDuffie (4-2, 3.89) relieved Reed and got the next two batters out without trouble. But the damage was done. Boog Powell's 6 RBI on the night had turned the game around. Quincey Trouppe tried to rally his teammates with a long home run in the top of the ninth that chased Johnny Allen, but Armando Benitez (5-4-22, 3.47) came in to close the game and the series out. 10-6, San Francisco. The San Francisco Seals are the 2005 ATL Union League Champions!!! Temperature: 51, Sky: partly cloudy, Wind: out to center at 11 MPH.